Purpose: Apocryphal - the language on the Diiv Word Wall. Restricted Collaboration: Only the following editors are allowed to edit this page, and only below the line shown in the code comments: RobinHood70, Legoless, Br3admax, Silencer, TheRealLurlock, Jeancey, Alphabetface, Jak Atackka, Eshe, Karnilmo, Alfwyn, Jimeee. Otherwise, if you have any comments or suggestions, please use the talk page. The purpose of this sandbox is to collaborate on a translation of the Word Wall in the 6th Chapter of the Black Book Waking Dreams, the Word Wall that gives the third word ( D3V ) of the Dragon Aspect shout. 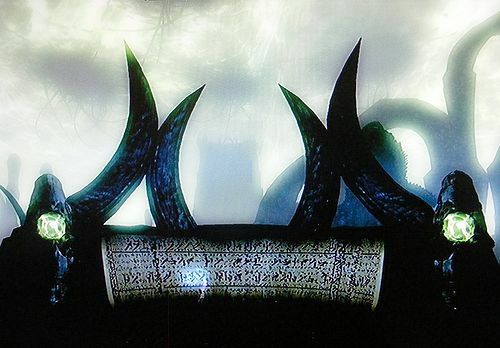 There are strange, moving words behind the Dragon Language text on the Wall, written in an unrecognisable language. The Dragon Language part of the Word Wall has already been translated. It is the moving words in the unrecognisable language that this project hopes to translate. I have decided on the interim name of "Apocryphal" for this new language, being that it seems to only be seen in this one location in Aprocrypha. We can debate this on the talk page. I have hand-picked a team to invite as participants on this project. 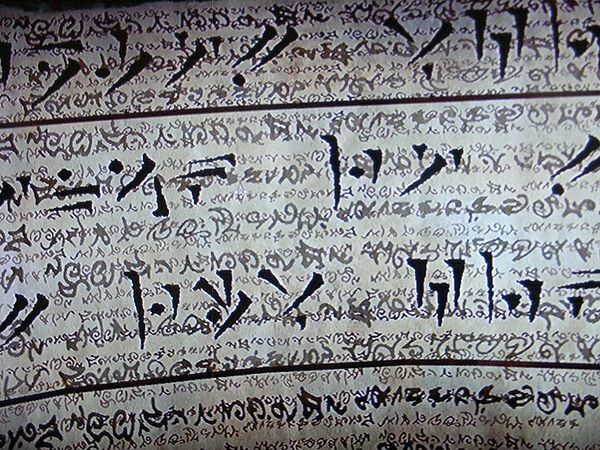 The invitees are primarily those who have previously been involved in Elder Scrolls language translations in the past on the wiki, particularly those who worked on the Magic Script Alphabet and the Elder Alphabet pages. An invitation to participate is just that, an invitation. It is not an expectation that any of the invitees will participate, although it is my sincere hope they will, as I could do with a lot of help on this project. If you have not specifically been invited to join this team, but you feel that you have something to contribute to this project, please do leave a message on the talk page. Your contribution may well give us an answer to something that has us all stumped. If you do make such a ground breaking suggestion, you will probably receive an invite to join the team. With all those words in an unknown language moving around on the Word Wall, it will be difficult to capture them effectively and pin them down. Here is a list of tasks I propose we follow in order to achieve the result desired. Capture a video of the complete sequence. Capture still images from the video. Create a draft Truetype font from the still images, in no specific order. Re-create the text in the order it appears in the video, using the Truetype font. Apply cryptanalysis tools to the resulting document. Create an ordered Truetype font, based on the results of the cryptanalysis. Document the new language in the Lore forum. Nothing is set in stone here, and all these steps are open to debate and discussion on the talk page. Here are some of the words on the Word Wall from the 6th Chapter of the Black Book Waking Dreams. A still image like this doesn't do them justice, as they are seen moving around in-game. We may even need to stitch together several still images to get the full text. It looks like it marquees around repeatedly, so we may just have to decided randomly where the start and end points are. Here are some tools I intend to use for this project, if you would like to suggest others, please add them to the talk page. FontForge — An outline font editor that lets you create your own Truetype fonts, or edit existing ones. Also lets you convert one format to another. It is available for Windows, Mac, and Unix / Linux. I am currently running version 13:48 GMT 22-Feb-2011. FontForge's user interface has been localized for: (English), Russian, Japanese, French, Italian, Spanish, Vietnamese, Greek, Simplified & Traditional Chinese, German, Polish, Ukrainian and Catalan. Online Frequency Analysis by Rumkin.com — One way to tell if you have a "transposition" style of cipher instead of an encrypting method is to perform a letter frequency analysis on the ciphertext. In English, you will have certain letters (E, T) show up more than others (Q, Z). To use this tool, just copy your text into the top box and a chart showing letter frequency will be generated in the bottom. Online Cryptogram Solver by Rumkin.com — Do you have a cryptogram, also known as a cryptoquip or a simple letter substitution cipher? Just paste it in and get it solved within seconds. If there are lots of possible solutions, only a subset will be shown. Only words that are found in the specified dictionary will be found. If there are proper names or misspellings, it may cause the puzzle to be unsolved. This page was last modified on 25 April 2013, at 10:46.